Recently I showed a cool cat card idea for Dad, and today I have another couple of manly projects up my sleeve. Yes, shirt sleeve literally, har... well, maybe not, considering this shirt is apparently sleeveless. Just the tiniest amount of quilling is involved - initials on the pocket. 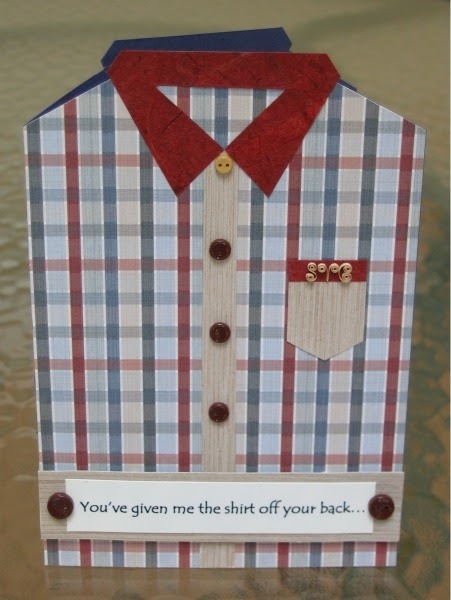 The collar and pocket edging are mulberry paper and the inside message simply reads, "Thanks, Dad!" And then there's a personalized photo frame... if you happen to know a father who rustles cattle for a living. Hmm, I realize that's quite a stretch. 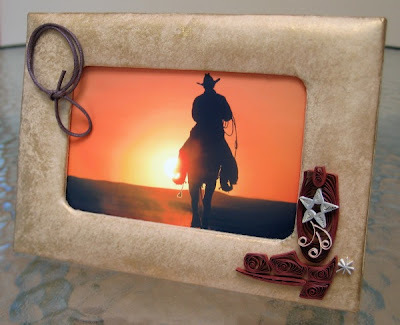 Maybe for the dad who loves to watch old westerns on tv? The lasso is coiled mizuhiki, which is very neat stuff, often seen beautifully knotted. It's used as a decoration on wrapped packages in Japan, and is made from washi paper that's twisted, coated with starch, and polished. Zakka Life, a favorite blog of mine, shows a lovely mizuhiki/gift wrapping example. 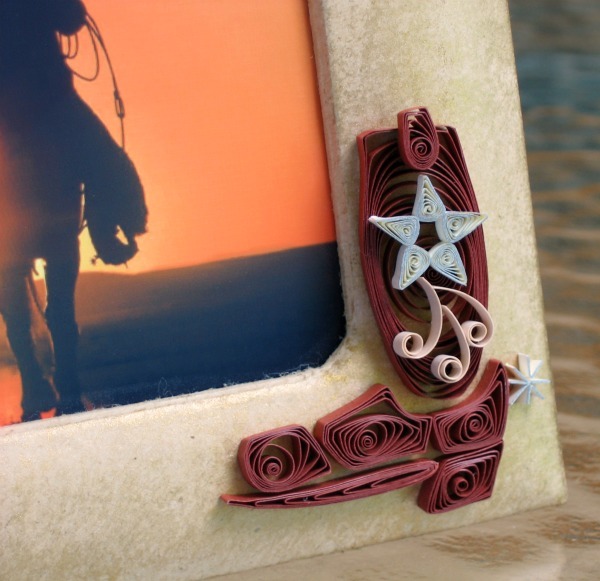 The boot was inspired by a clip-art image, and I used silver-edged quilling paper to add shine to the star and spur. All of the supplies used to make this card are from Custom Quilling, which is an affiliate link. What a great boot Ann. The boots look really cool. Love it! And also the sentiments on the first card. Wonderful inspirations Ann. The cowboy boot is awesome! And, I love your use of the mizuhiki cord as a little lasso, very clever. Have you found a winner of your beautiful book-candy? Melissa, I was thinking of you and Muleman! Ann, your comment made me laugh out loud - so clever! Helle, the winners were announced on Sunday on the Giveaway post. Good luck next time!